About Oakside Oakside may not be the prettiest non league ground around but it certainly has bundles of character. Originally the home of Rush Green, who later became Barkingside FC, the main tenants today are Redbridge FC, who themselves used to be better known as Ford United. The original blue main stand is certainly there for character and not for comfort with old seating and posts obscuring the view but this is one of the grounds where standing gives you a better view simply because of the raised terrace areas behind the goal and either side of the main stand. On the far side of the pitch is a covered terrace with one step but for the modest crowds the ground is ideal. Significant investment has been ploughed into the club and the first area for redevelopment has been the club house which is now a 6 days a week operation. Very well decorated, three big screens with Sky TV, pool table and a view of the action from the bar. The next phase will see changes to the ground itself but as everything now with Redbridge it will be done in a timely manner. How to get to Oakside One of the easiest Non League grounds to find both my public transport and car. Best option is by tube on the Central Line to Barkingside, which is slap bang next to the ground. Do not get off at Redbridge which is a good 3 mile hike away. By car either use the A406 North Circular and exit at the Redbridge roundabout. Follow A12 away from London (Eastern Avenue) until you reach the Gants Hill roundabout. Take A123 (Cranbrook Road) north for around a mile and a half and just after the cricket ground on your left take a right into Tanners Lane. Follow this road past Sainsbury’s and you will see the sign for the Football Club. Turn right and then go up the hill. Entrance to ground is on other side of the bridge. From the west follow the A12 from Junction 29 of the M25 for around 11 miles. When you pass Newbury Park station on your right get into the right hand lane. At the traffic lights turn right into Horns Road and follow this for around a mile until you see signs for Barkingside Tube. Then as above. Parking is free. Admission to Oakside A bargain £5 for adults, £1 for concessions at Redbridge this season. Programmes are £1.50. Our last visit – January 2011 vs Enfield Town It is not often you walk away from a football match counting how much money you have left in your wallet and thinking that you must have had a hidden £20 in there. Admission, programme, beer, plate (yes PLATE) of chips and still change from a tenner (almost) is a bargain in anyone’s book irrespective of the twenty two players running around a muddy pitch. But this is Non League football and it is these surprises that keep me coming back for more. 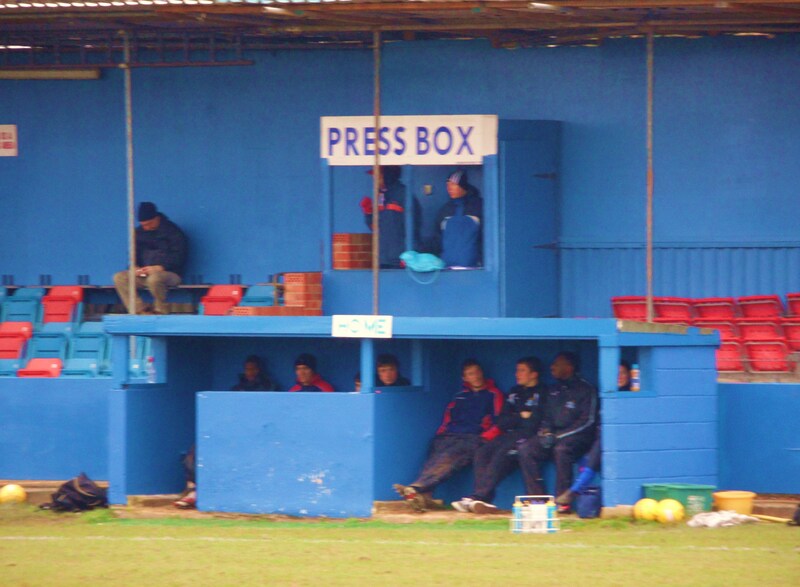 Today’s venue was Oakside Stadium, home to Ford United, no Brigg Sports, oh hang on Barkingside FC, shut up Redbridge FC. 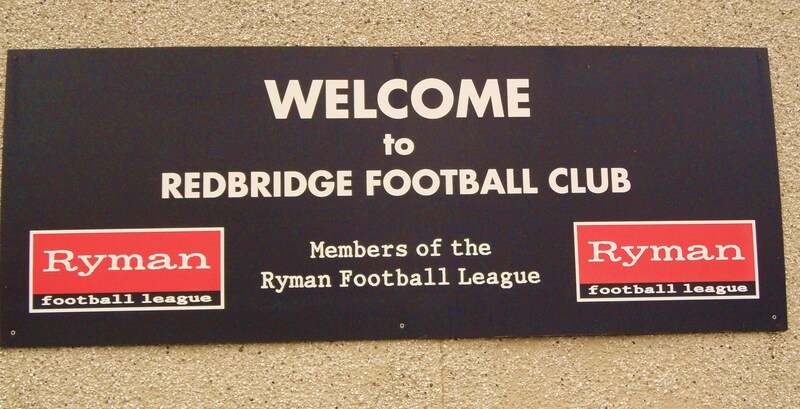 You see Redbridge have had a confusing upbringing, once the club of the Ford Motor Company who got bored of winning the Car Manufacturers Premier League Trophy every year (well, Vauxhall Motors were the only competitors after DeLorean Argyle went pop in the Seventies) and are today the club of the people’s republic of Barkingside. For a proper history lesson, click here and read Adam Dennehey’s account. So why was I here, alongside 210 other spectators freezing my nuts off on a Saturday afternoon? Because I am addicted to non league football. Despite my regular visits to NLFA meetings (Non League Fans Anonymous) I cannot resist a sneaky trip to a new ground when given the slightest window. So today, when I was given “time off for good behavior” by CMF for taking the girls swimming I used my new iPhone App (I’ve updated the crystal ball – technology eh) to determine that there was one stand out game today – Redbridge versus community pioneers Enfield Town. 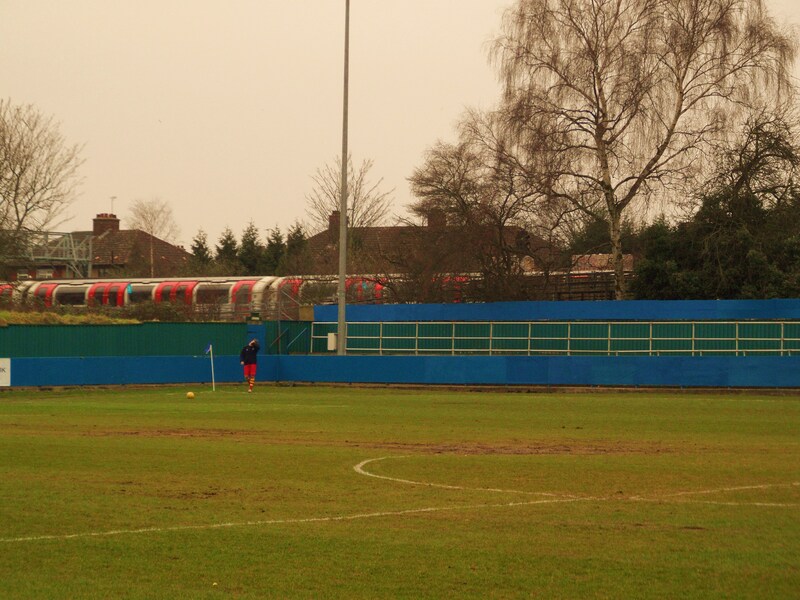 Oakside Stadium, home of For…sorry Redbridge is slap bang next to Barkingside tube station. So a perfect venue to let the train take the strain? Absolutely not. The issue here, as Dagenham Dan pointed out is that despite the fact you may only live a few miles away (as he does), the journey may take over an hour as you have to go into London to come out again. So we drove. Sorry Al Gore but it is a Convenient Truth that it is three times quicker to drive to IG6, just five minutes from the North Circular than it would be to take the train. With Dagenham & Redbridge (not to be confused with Redbridge dumbo) not having a game, Dagenham Dan, Brian and the rest of the Dagenham Daggers were also in the house for this. First surprise of the day – £5 Admission. The cheapest we have seen all season and a Danny Last FIFA 5 stars for the club for that. Programme £1.50, pint of San Miguel £2.50 and finally a plate of chips for £1. Lolly and I had a wander around the ground pre-match and found a ball. Not just any ball, but an “official Ryman League ball”. Now we could have simply thrown it back into the pitch, but they had far too many there already so we took a few pictures of it. It became our friend, accompanying us on our walk around the ground, posing for pictures along the way. When it was time to say goodbye there were tears, but we all knew it was only going to be a fling. The teams walked out onto the pitch with Enfield Town wearing a fetching yellow and red striped kit, almost Lens like. They are another club who are on the rise again, having been formed from the ashes of the once great non league club Enfield FC who for so long were banging on the door of the Football League when that fair and democratic process known as “Re-election” was in place. Ninety two chairmen sat in a room at the end of the season and tactically voted for each other, over cigars and cognac. If someone looked like they may not get enough votes he would wheel in some “entertainment” for the rest of the club and they would all laugh at keeping out those “non league upstarts”. Teams like AFC Wimbledon, AFC Telford United FC, FC United of Manchester and of course my own beloved Lewes have to give Enfield Town a big slap on the back as they were the first ever Community Trust Club, formed in June 2001. They are currently working on transforming an Athletics stadium to be their ground, the final part in their return to being their “own club”. Redbridge had themselves been on a bit of a roll. After we had seen them win impressively away at Thamesmead a few weeks ago they had recorded further wins against Heybridge Swifts and Ware, lifting them out of the danger zone. But this game was going to be a test for them. Redbridge 0 Enfield Town 2 – Oakside Stadium – Saturday 29th January 2011 There were two notable highlights for us in the first half. Firstly we discovered we could use our “net cam” for the first time this season. Last seen in use at Worcester City at the back end of the 2009/10 season it is always a joy to use it. Now don’t get too excited by this and start trying to find this on Amazon because it doesn’t actually exist. It is simply the fact that the goal nets were so close to the perimeter track that you could (and we did) put your hand into the goal and take pictures. I am sure that broke some FA rule somehow…. And talking of FA rules we heard a new one today. Picture the scene. Redbridge attack and they shoot just wide and the ball rebounds out to the side of the pitch where it nestles at the foot of the linesman, who has his flag raised to indicate a goal kick. The keeper stands on his 6 yard box assuming that the “assistant” will kick it back. Oh no, as the linesman explains to the exasperated keeper, he is not allowed to. “Don’t blame me” he said in some sort of excuse for his lack of action “it’s the suits at the FA”. The half petered out with Enfield having the better of the first period but still without really testing the Redbridge keeper. Star of the show was Adam Wallace, who we dubbed “Pele”. Nothing to do with the silky skills on offer but the fact I had promised on Twitter that the Brazilian would be making an appearance at the game today, and he was the nearest as damn it to world’s greatest ever player (well, he wore the number 10 anyway). The referee put an end to the freezing cold first half and the players trudged off to the dressing room. All except Redbridge’s Korean player, Lee. In the final minutes of the half he had picked up a nasty snap to his hair band and his Mum who was in the crowd could not cope with the shame of his messy bonnet so she rushed to his side to apply some emergency repair work. Mum’s eh! Don’t you just love ’em. It was no surprise that Enfield took control in the second half, although it did take them nearly fifteen minutes to eventually break the deadlock when that man Pele Edwards slotted home from close range. One became two in the 80th minute when a move that Arsenal would have been proud of eventually saw the ball passed around the Redbridge keeper for Moore to slot home. Virtually every one of the 211 spectators rose and applauded the goal – a worthy effort on any stage. Two nil was a fair reflection in the end. Redbridge’s mini-revival had been halted by a team on a roll themselves. We were left to head into the very well appointed club house to watch the scores roll in and have a chat with a few of the fans from both teams. You see without any policing or stewarding, this sort of thing happens at non league football without any issues. That and the wonderful money fairies putting £20 notes back into your wallet. To read a proper match report, click here and to see more photos from our day with Redbridge head over to our Flickr stream here.